This cartoon illustrated an article of mine which was published in the Vol. 24 No. 1 issue of the Skeptic (2004). The pdf of the issue can be downloaded here, but it's very slow on dial-up. Skip ahead to page 16 (where my article starts) if you want to save some scrolling time. Worth it if you would like a more comprehensive treatment of special pleading... and if you really dislike the pretentiousness of arts wankers. In the article, I expended about 6000 words in a rant on special pleading in the visual arts. 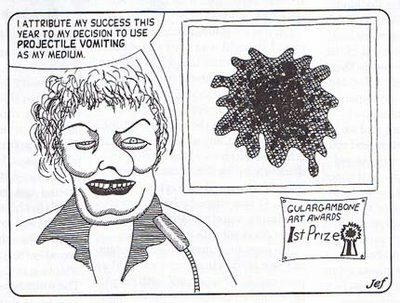 The basic theme was that we mere mortals shouldn't be intimidated by arts wankers when expressing disdain for poor artwork, as the arts priesthood typically engages in extremely transparent special pleading (an informal logical fallacy) in order to protect their privileged positions. They engage in pretence and mutual onanistic gratification, which in most cases doesn't stand up to any sort of objecive scrutiny by the skeptical outsider. I am posting this old cartoon of mine here to illustrate a nice passage from one of my favourite authors, Paul Theroux, which takes a pithy skeptical line on the same issue. It is from his travel book The Pillars of Hercules (p. 391). He describes a visit to a museum of art, and comments on one work in the following terms: "... and the last resort of the artist barren of imagination, broken crockery glued to plywood... - perhaps the splinters and shards of the very plates the artist's spouse had flung in frustration, crying, 'why don't you get a job!'." He then says that we have "all been in such art museums and said, 'It makes me mad.' And then been told by the ludicrous supporters of such junk, 'That's good. It's supposed to make you mad.'" Tagged - Fallacy, Skepticism, Special Pleading.